Ibrahim “Surf” Bilali was born on July 21 1965. A nimble but stylish boxer, Bilali is probably the most talented amateur boxer in Kenya. Bilali was a true master of his craft, dazzling opponents with bobs and weaves while leaving them with no room to attack. While still a student at Highway secondary school, his talents caught the attention of scouts from Kenya Breweries boxing club. He soon joined KBL and they would send a vehicle to come to highway every evening to drive him to the club’s boxing gym in Ruaraka every evening. His first burst onto the international scene he was only 17 years old in 1982. As a Light Flyweight, he participated in the world boxing championships, reaching the quarter-finals before losing to Yong-Mo Heo of Korea. That same year, he won the Light Flyweight title at the East and Central Africa boxing championships that were held in Bulawayo Zimbabwe. He beat Lucky Siame of Zambia in the final. It was at the 1982 Commonwealth games that Bilali first captured the imagination of the Kenyan public. At age 17 and still a student at the Commonwealth games in Brisbane, beating John Lyon of England in the final. 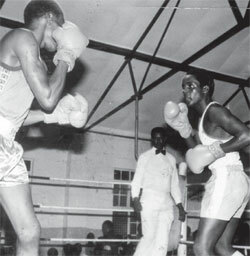 IN 1983, the African boxing championships were held in Kampala, Uganda. Bilali won the gold medal after beating David Mwaba of Tanzania in the final. In 1984, he joined the national team that participated in the 1984 Olympics, he reached the semi finals thus winning and a bronze medal. That same year, Bilali boxed at the Kings cup where he reached the finals before losing to Yong-Mo Heo of Korea. Bilali disappeared from the boxing scene after he won the bronze medal in Los Angeles in 1984. He was only 19 at the time and appeared to have a very promising future. He likely would have been part of the legendary hit squad that won eight gold medals at the 1987 All Africa games and probably would have become the first Kenyan to win Olympic gold and perhaps gone on to a successful professional career. His younger brother Suleiman Bilali won gold medals at the 2003 and 2007 All Africa games. This entry was posted in kenya boxing, Kenya's top sportsmen and women, kenyan boxers and tagged 1984 Olympics, Ibrahim "Surf" Bilali, Ibrahim Bilali, kenya boxers. Bookmark the permalink.